This week in Austin Texas USA took place the 2012 ACM CHI conference. Klewel is proud to be the webcasting partner of SIG (special interest group) CHI (computer human interaction). The presentations are available through the ACM Digital Library for ACM members only. The past 5 annual conferences have been webcasted by Klewel. The ACM SIGCHI Conference on Human Factors in Computing Systems is the premier international conference on human-computer interaction. CHI 2012 focuses on the centrality of experience from the models, theories and practical insights we need to understand and design for user experience to experiencing innovation through hands-on interactivity. The conference gathered 2555 attendees. Two keynote speakers from YouTube and MIT Media Lab presented their work. Featuring over 900 works, the CHI conference is the premier worldwide forum for the exchange of information on all aspects of human-computer interaction. Typically the works presented address the concerns of design, engineering, management and user experience professionals. This year’s conference also features works that focus on: Digital Arts, Games and Entertainment, Human-Computer Interaction for Kids, Health and Sustainability. After two days of intimate pre-conference workshops, the main conference includes panel discussions, courses that provide leading-edge HCI knowledge, paper sessions, case studies, works-in-progress, student competitions (involving design, research and games), interactive demonstrations, special interest groups, and a Tuesday evening video night (popcorn included). 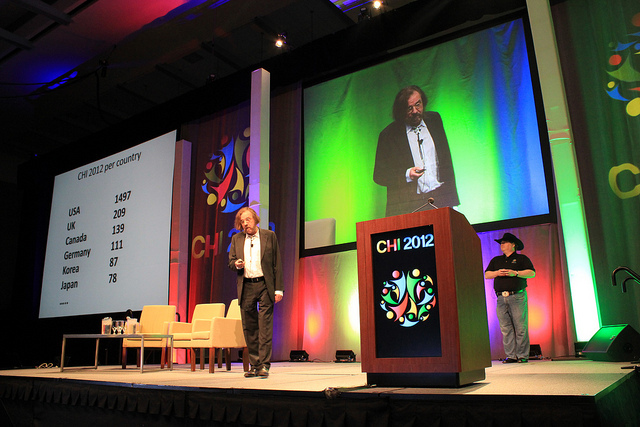 G+: coverage of the CHI2012 conference points to the direction of future for HCI and user interfaces. Paul Dourish ‏ @dourish noticing at #chi2012 that my enjoyment of talks is inversely proportional to occurences of the word “users.” i’d rather hear about people.